Cullen traveled to Halifax to present a talk about the early stages of the InFORM project and efforts to build a citizen scientist network and mobilize knowledge about the impacts of the Fukushima Dai-ichi disaster on the health of the North Pacific and residents of Canada’s west coast.The Mobilizing Science Knowledge & Research in the 21st Century: An NCE Sharing of Best Practices Symposium was hosted by our funding National Centre of Excellence The Marine Environmental Observation Prediction and Response Network (MEOPAR). Cullen was invited to speak with InFORM Principal Investigator Dr. Jing Chen (Health Canada). The talks addressed best practices when communicating with the public about risks associated with ionizing radiation in the environment and the initiation and early results of the InFORM project. An abstract of the talk can be found in the conference program. 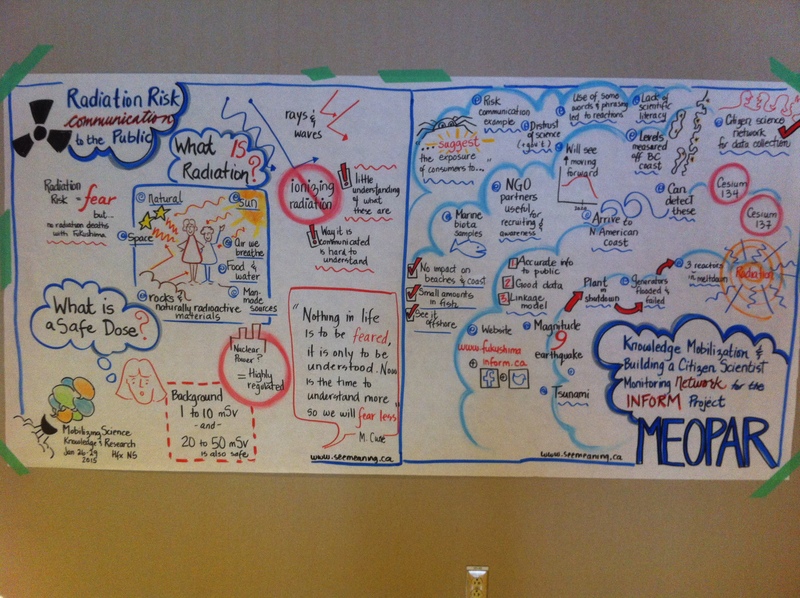 During the lectures at the event MEOPAR had a graphic artist Corrie Melanson of seemeaning.ca document the talk as the speaker addressed the conference. The graphic resulting from Dr. Chen and Cullen’s lecture is shown below. Reblogged this on Fukushima InFORM.